Are you a huge Star Wars fanboy? 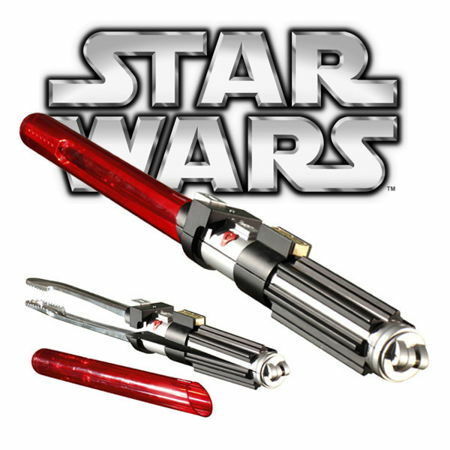 If you have answered in the affirmative, then you would certainly be interested in this particular pair of Star Wars Lightsaber BBQ Tongs which will retail for £19.99 per pair. After all, saving the galaxy from the tyranny of an evil Emperor will also require for you to eat so that you have the sustenance to be able to go out and shoot down a few TIE fighters while you are at it. In fact, why not invite the rest of your extended family over to your house and throw a BBQ party? This would give you the perfect chance to enjoy a marathon session of Star Wars movies after that, but before that, why not turn over some juicy slabs of meat using this unique pair of Star Wars Lightsaber BBQ Tongs. There is also a transparent red plastic cover which will keep the prongs together whenever they are not in use.